The ROCKSTAR ENERGY DRINK MAYHEM FESTIVAL Kicks Off TODAY in San Diego, CA! 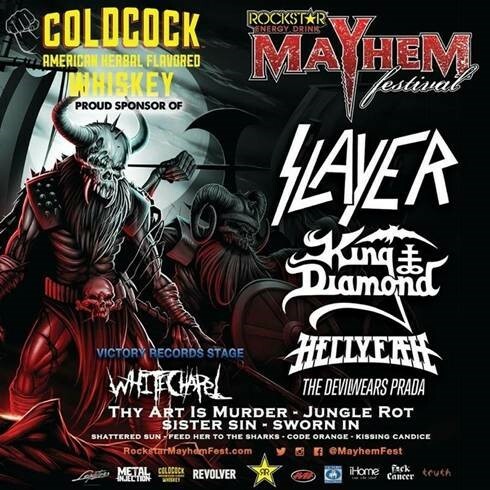 The ROCKSTAR ENERGY DRINK MAYHEM FESTIVAL kicks off today in San Diego, CA, and official sponsor COLDCOCK American Herbal Whiskey is celebrating with the announcement of several exclusive signings at eight show stops, featuring none other than Kerry King of headlining legends Slayer! King will meet fans at signings today in San Diego, as well as in San Bernardino, Phoenix, Indianapolis, Milwaukee, Tinley Park (Chicago), Holmdel, Camden (Philadelphia), Boston, and Dallas markets. The signings will take place at 5:30pm each day at the COLDCOCK Whiskey tent. Fans must be 21+ to take attend the signings and should visit the tent for further details at each stop. Tickets for the ROCKSTAR ENERGY DRINK MAYHEM FESTIVAL are on sale now for all markets! Get your tickets via www.rockstarmayhemfest.com. The festival kicks off today at Sleep Train Amphitheater in San Diego, CA and ends at Gexa Energy Amphitheater in Dallas, TX on August 2nd. See below for all confirmed tour dates.